Beetroot leaves are often discarded and it’s a shame as they have great flavour and a good nutritional profile. They’re packed full of antioxidants and are also high in vitamins and minerals including iron. They can be used in any recipe where you’d normally use chard or even spinach. Although we put everything biodegradable in the compost heap, so nothing really goes to waste, I do like to make the most of fruit and vegetables. I use the roots, stems and leaves of beetroot in my cooking. All of them make a good smoothie, but I had other plans for the roots and stems this time. 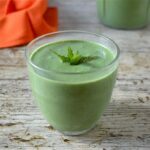 Scroll down the post to get the recipe for my beetroot leaf green smoothie. Kefir is my standard base for smoothies. It’s a good all round probiotic and contains high levels of vitamin B12, which can be tricky for vegetarians to get. Vegans even more so. I’m not a nutritionist, but I understand even non-dairy kefir contains significant levels. Goji berries are good for vitamin C which aids the absorption of iron present in the beetroot greens, so a few of those went into the mix. I also tend to add a little spirulina to my green smoothies. 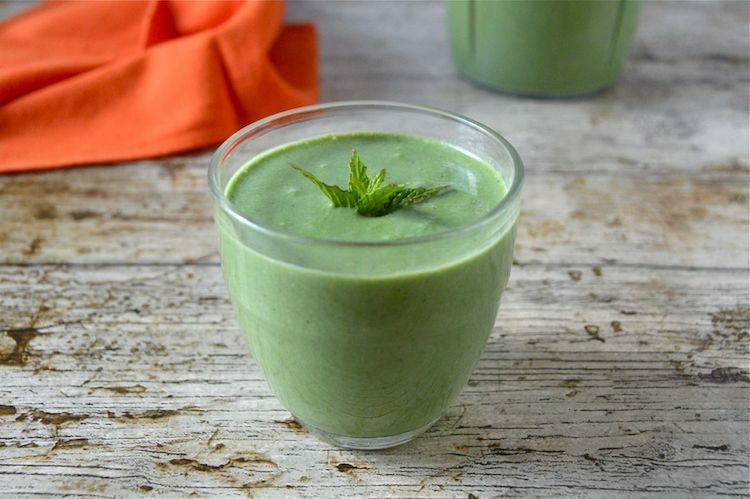 This helps to give the smoothie a brighter and more appealing green colour. Having said that, when I once used spirulina alone, it gave a horrid alien bluey green which was quite off-putting. It has quite a strong flavour too, so I find a little goes a long way. I added oats for a bit of substance, chia seeds for extra protein, banana for sweetness and orange & cardamom for flavour. You can, of course, use chard or spinach instead of the beetroot leaves. The Optimum Nutri Force Extractor is the latest blender on offer from Froothie. It’s a neat little machine and sits nicely on the counter top. Lookin’ good in red, silver or black and taking up relatively little space – what’s not to like? It also only weighs 3.4 kilos, which is significantly less than its nearest competitor. Small and light it may be, but it sure is powerful. The 1000W motor, 20,000 rpm speed and six blade stainless steel assembly can cope with pretty much anything you throw at it, I mean in it. Well everything I’ve thrown in it anyway. It’s sleek in design and simple to use with three one touch buttons. Turn it on, pulse at high speed or blend at low or high speed. You can turn it off at any point, but the motor automatically cuts out at fifty seconds, which I’ve found is just about right to make a good smoothie. You’ll need to wait five minutes before you can use it again. This prevents overheating and burn out. The Nutri Force is designed to be a single-serve blender, but it has a capacity of one litre, so I find it easily makes enough for two of us. Alternatively one serving can be consumed immediately and the other put in the fridge for the morrow. The photos you can see here were for a garlic mint feta filling I used in these cucumber roll-ups – delicious. The coffee grinder is an added bonus. It has a 450ml cup and I’ve used it to grind almonds and apricot kernels for a cake I’ll be writing about at some future date and to make pesto. It did the respective jobs perfectly and I’m really pleased with it. I haven’t tried to grind coffee beans, but I’m sure it’s very adept at it. It’s also meant to be good for making nut butters, but I haven’t tried that either – yet! It has a 4 blade stainless steel assembly which comes apart easily for cleaning and maintenance. Both blender and grinder cups are made of Tritan and are BPA free. One of the many things I like about the Nutri Force, is that I can make a smoothie, take out what I need, then just screw on a lid and place in the fridge for the next day. Much less fuss and mess than when using a large blender. Normally, I have to find an additional container to keep my beetroot leaf green smoothie in. Inevitably, I manage to spill a little when transferring it into the container, which I find very annoying. The Nutri Force comes with two storage lids and a flip top lid for drinking on the go. It also has a versatile travel handle that can be attached if needed. The lids and handle are all part of this clever eight piece kit. It enables busy folk to easily have a nutritious breakfast whilst waiting at the bus stop, sitting on the tube or like me, just generally running late. Froothie have come up with several videos showing the new Nutri Force in action. Here’s one of them. If you’d like to order an Optimum Nutri Force Extractor, it’s currently on offer at £99. Order it or any other Froothie appliance through either of these links and I can offer Tin and Thyme readers free P&P. Just add 2483 free ambassador delivery to the comment box when ordering. Delivery will be credited back onto your card. An easy and nutritious way to use your beetroot leaves. Works equally well with chard or spinach. Place all ingredients into a blender and blitz for 50 seconds (I used the Optimum Nutri Force Extractor). You may need to blitz for longer depending on what blender you're using). Can serve 2-4 people depending on what size glasses you use. I’m sharing this beetroot leaf green smoothie with #CookBlogShare which is being hosted at Easy Peasy Foodie this week. Beetroot Leaf Green Smoothie. PIN IT. What a great way to use beetroot leaves. They are so tasty and packed with nutrients, it’s only great little blenders like the Nutri Force that make using ingredients like beetroot leaves so easy. As beetroot is one of the few things we’ve managed to grow, I’ve been eating quite a lot of them 🙂 Smoothies are a great way to use some up and the Nutri Force is a star. Well I’m really liking this blender. It’s compact and powerful. But it only takes a litre, so you might need a bigger one depending on what you want to do with it. That looks like a great blender. I like to use the beet greens too. I think when you grow your own food, you’re more likely to make the most of it. And it really is a super little blender. Thanks Monika. It’s feast or famine. I have a whole fridge drawer full of them at the moment. Some went into tonight’s dhal and I’ll be making a smoothie with some of them again tomorrow. But after that I’ll most likely have none until I grow some next year. The leaves and stems work wonderfully well in curries, stews and stir fries too – don’t throw them away Kirsty. What a great way of making the most of all of the plant! I like the idea of getting all the goodness out. Yes, it’s a shame to let those lovely leaves go to waste. I love beetroot in smoothies and juices but thanks for letting me know I can use the leaves too! Beetroot leaves are really tasty and they work brilliantly in smoothies as well as many other things. Not sure where to get beetroot greens because most supermarkets cut off the beetroot tops. Don’t know kefir at all but would like to investigate because of its B12 content. It sounds delicious and I love the sound of your Nutri Force! I could definitely do with a new blender at the moment! I really need to get more into smoothies and we recenrly got a new blender (not a froothie!) so I’ll have to try this! Not a Froothie? I’m shocked 😉 I’m not sure where I’d be anymore without smoothies. I have them for breakfast now most days.